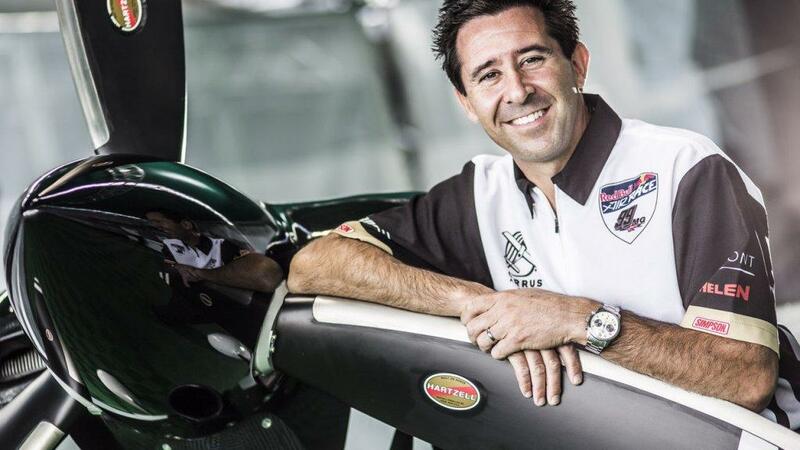 Piqua, Ohio, Feb. 12, 2015 – Hartzell Propeller has extended its sponsorship relationship with Michael Goulian for the 2015 Red Bull Air Race World Championship. This is the second consecutive year for the partnership between the aviation superstar and Hartzell. “We were so pleased with being able to sponsor exciting airshow veteran Michael Goulian for the Red Bull Air Races in 2014 that we wanted to do it again. He personifies the excitement for aviation and flying that as a company and as individual aviators we fully embrace,” said Hartzell Propeller President Joe Brown. As the official propeller technical partner for the Red Bull Air Race World Championship, Hartzell will also provide its three-blade structural composite propeller known as The Claw, carbon fiber composite spinners and lightweight governors to each of the race teams. In addition, Hartzell is providing complete propeller technical support and maintenance services for all of the race entrants. Hartzell’s three-bladed structural composite propeller was nicknamed the Claw due to its high thrust and low gyroscopic forces and inertia. These characteristics, coupled with the strength of the composite construction, make it an ideal match for the race series. The Red Bull Air Race World Championship is an official World Championship, accredited by the FAI – The World Air Sports Federation. Since it was launched, the Red Bull Air Race World Championship has become globally renowned as the fastest and most exhilarating motorsport on the planet. Devised by the Red Bull sports think-tank, the initial goal was to create the most advanced aerial challenge the world had ever seen; what has evolved into the Red Bull Air Races has far exceeded original expectations. It is a visual spectacle unlike any other. A combination of high speed, low altitude and extreme maneuverability make it only accessible to the world’s most exceptional pilots. Michael Goulian, of Goulian Aerosports, doesn’t just fly an air show; he attacks it. Millions of airshow spectators around the globe have witnessed the ferocity of a Mike Goulian air show performance. Every roll, pull, and tumble of his flight is a deliberate execution of precision. With his aggressive approach to the air show arena, Mike Goulian has mastered the ability to convey his message of passion through flight. Goulian reached the pinnacle of the sport when he won the United States Unlimited Aerobatic Championship at only 27 years of age. Mike returns to the competitive world with his participation in the Red Bull Air Race World Championship series. Hartzell Propeller and its sister company, Hartzell Engine Technologies LLC, form the general aviation business unit of Tailwind Technologies Inc. This growing aerospace technology company also includes Hartzell Aerospace and Mayday Manufacturing. For more info on Hartzell Propeller go to www.hartzellprop.com.